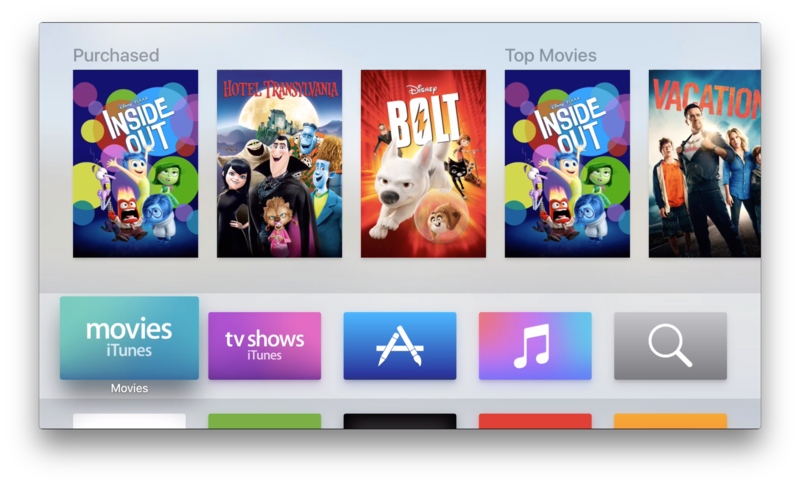 While the new fourth-generation Apple TV advances Apple’s entertainment box in many areas including universal search, Siri input and a whole App Store for the first time, much of week one with Apple TV 4 has been about what you lose when moving from Apple TV 2 or 3. The list is uncomfortably packed for a device that had three years to advance since its predecessor hit the market: missing Bluetooth keyboard and iPhone/iPad Remote app support for easier text input, Apple Watch’s built-in Remote app doesn’t recognize it yet, the Podcasts app hasn’t moved over, and the Photos app is exactly the same (no iCloud Photo Library) despite the newer iCloud Music Library feature making the cut for Apple Music. There’s also the oddity of each channel being pre-installed on older Apple TVs while new Apple TVs ship with only iTunes, Music, and Photos apps installed. 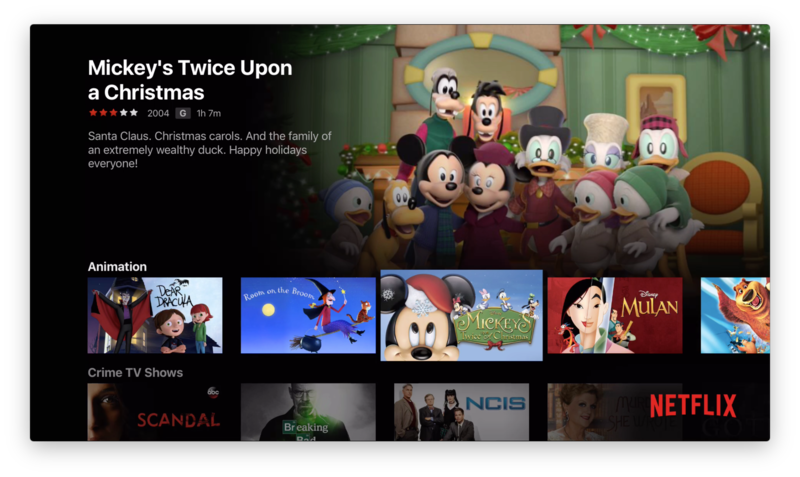 If I were gifting a family member a new Apple TV — something I’m sure will be popular during the holidays — I’d prefer essential channels like Netflix, Hulu, YouTube, and HBO to come pre-installed, albeit optionally deletable, to make the experience friendlier. There’s also the lack of one universal sign-in process between multiple channels so that’s a big setup challenge. I had hoped Apple would tackle this with the new box but instead its just like the prior Apple TV experience. 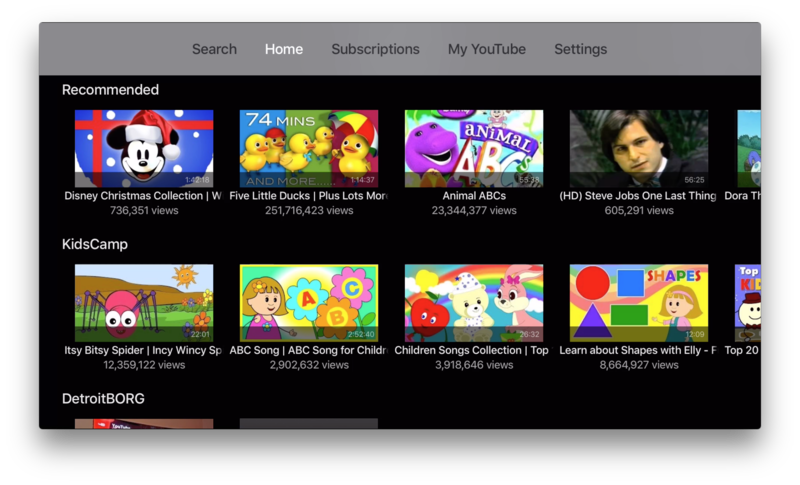 That being said, my biggest critique and one I haven’t seen acknowledged nearly enough this week is the drop in usability of popular video apps, like the ones that used to be pre-installed on the third-gen Apple TV as ‘channels’. Simpler, list-focused versions of apps like Netflix and Hulu were just easier to use than current versions on the new Apple TV. The tvOS software running on the new Apple TV is flashier and more capable as a platform than past versions of the software running on Apple TVs despite the missing features that will surely return with time. Right now, though, most video apps are now worse with harder-to-use layouts. Video apps aren’t constrained in the same way they were with the template-system of previous Apple TV software, so tvOS is giving them the freedom to do things worse. This is counterintuitive to what you expect, as you assume the new device to be better and more capable, but this is sadly not the case. Like new Apple TV overall but apps for channels from old box worse. Netflix is a mess to browse & Hulu can be slow to launch. Uniform lost. Take the new Netflix app as an example. Netflix gives you full access to its library of streaming movies and TV shows for a monthly subscription fee, and finding your way around that massive catalog requires great organisation to have a good experience. 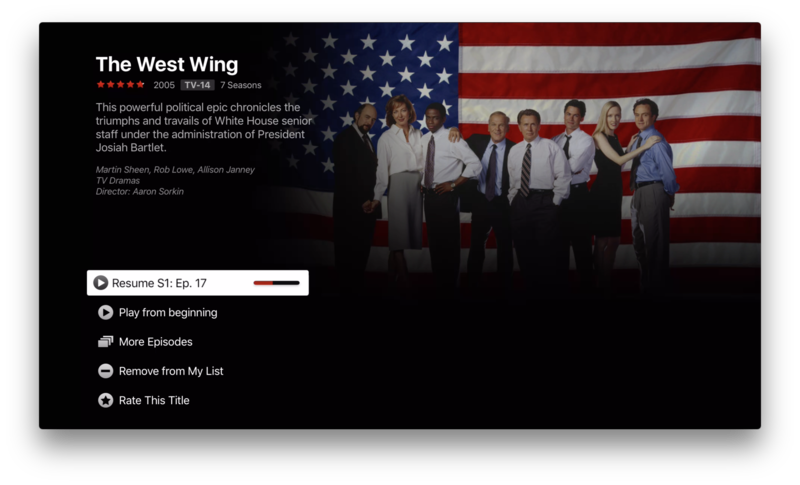 The old Apple TV app for Netflix (above) featured a stripped down menu list that made navigating extremely simple. After choosing your user account, the navigation list let you pick between movies genres and TV shows while presenting new releases and the very important ‘My List’ of manually saved shows to watch later. 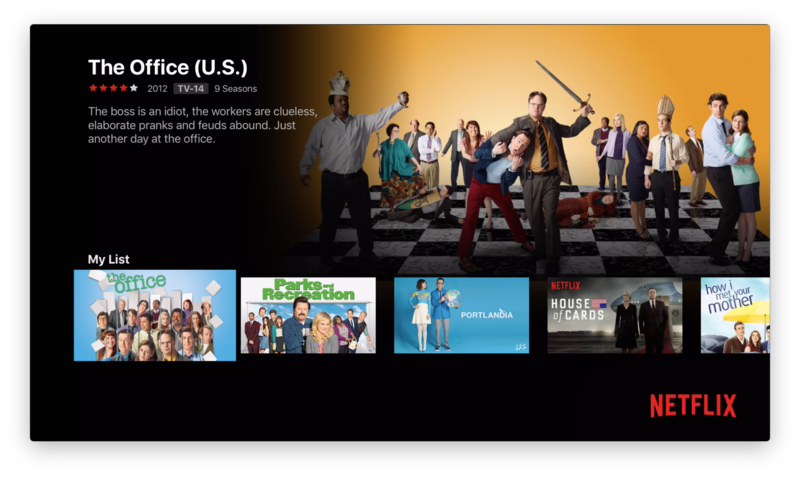 The new Apple TV Netflix app (above) is visually more impressive and perhaps makes discovering new content easier, but navigating to core places in the app is noticeably more difficult. The newer version is a definite step backward in usability from my experience. The main view is split in two parts: a detailed preview on the top half and content navigation on the bottom half. Moreover, the focus is only ever on one row of results at a time. A large Netflix logo hides much of the second row. Finding the My List section is actually quite hard with the new app. It’s right at the bottom of the list, the 37th row from the top. 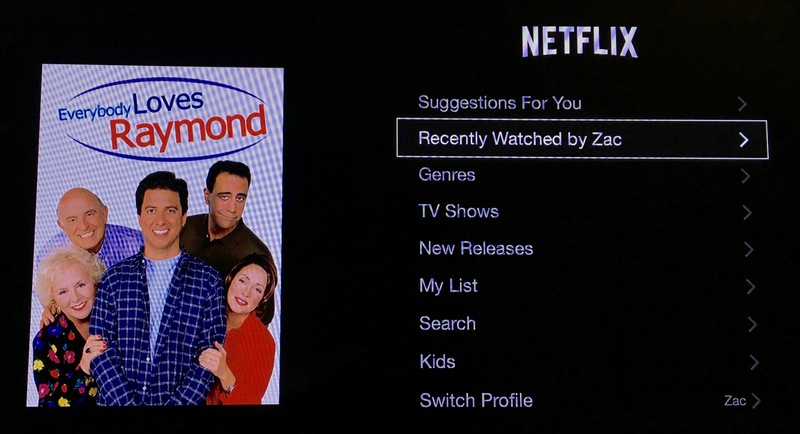 In fact, My List is located below obscure film collections and series recommendations that Netflix somehow considers more important. Once you discover that it takes several swipes down every time you want to access your saved shows, the new layout on the 4th-gen app feels a lot more limited than its predecessor. The old My List screen displayed up to 14 movies or TV shows in your saved collection at once. The new buried My List is reduced to a row and limited to just 4 and a half titles that you swipe through. Don’t worry, the heavy Netflix brand logo to remind you which app you’re in doesn’t interfere here, thankfully. It’s not all bad news. On the new Apple TV, the screen where you resume playing a movie or TV show consolidates what used to take three separate steps into one. You can choose to resume playback, start video from beginning, or browse more episodes all through one screen. It’s easy to miss but this is an improvement from the old version, which would always surprise me by showing one more step than I was expecting. I won’t dive so deep into the next app, Hulu, but from the initial starting page can you locate the Queue section? 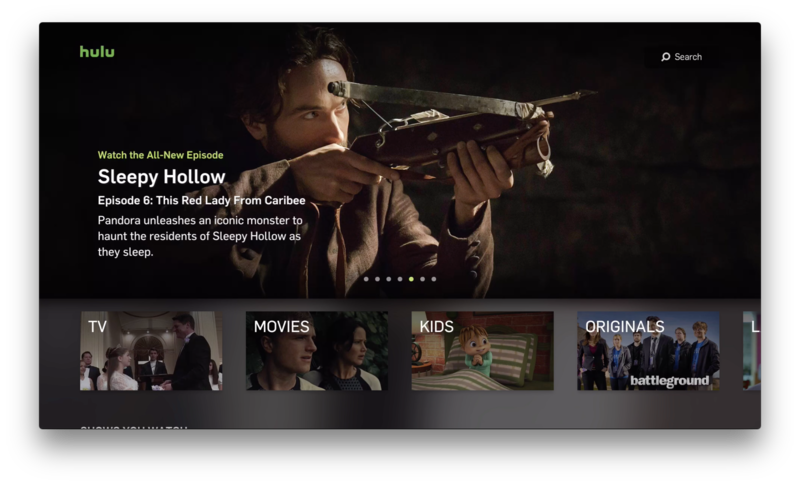 The top carousel of slides promotes what Hulu wants you to see (or thinks everyone will want to see?) and the next row down does an okay job of showing you shows you’ve recently watched although it’s a little tricky when you share an account with your house. For me the important Queue section was located as the 9th tile on the first row after TV, Movies, Kids, Originals, Latino, British, Anime, and Korean Drama. Not a knock against any of those collections, but Queue being placed after them all is a curious decision. 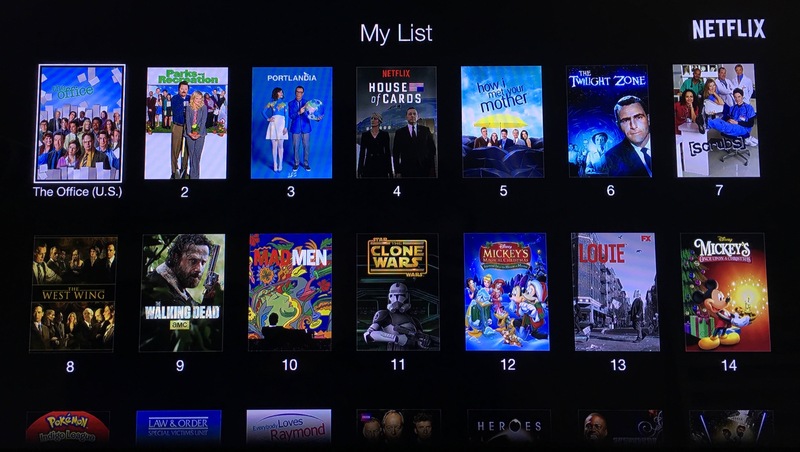 Compare that to the clear organization on the Apple TV 2/3 version of Hulu where Queue, the place I typically start watching shows, is prominently displayed at the top center. Now that I know Queue is around the 9th tile on the first row it’s not a big deal to locate it next time, but its poor placement made me think it was just removed initially. Without the top navigation menu or an equivalent replacement, I also find myself unsure at times at where I am in the new app. 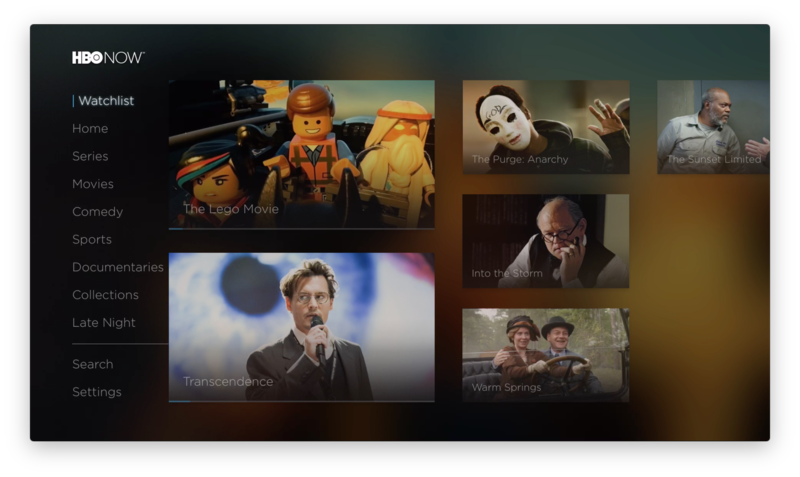 Other apps do a better job, taking advantage of the layout possibilities with the new Apple TV. HBO Now, for example, doesn’t much resemble the old channel which could be confusing for upgraders, but the new version does closely resemble the iPad and iPhone version. What’s more, the important Watchlist section is placed in clear view and still manages to show off large artwork for movie and TV show titles. My one disappointment here is that the new HBO app doesn’t offer an option to reverse the order of episodes in a season list and Watchlist only seems to work on individual episodes that you add rather than catching all new unwatched shows in a series. 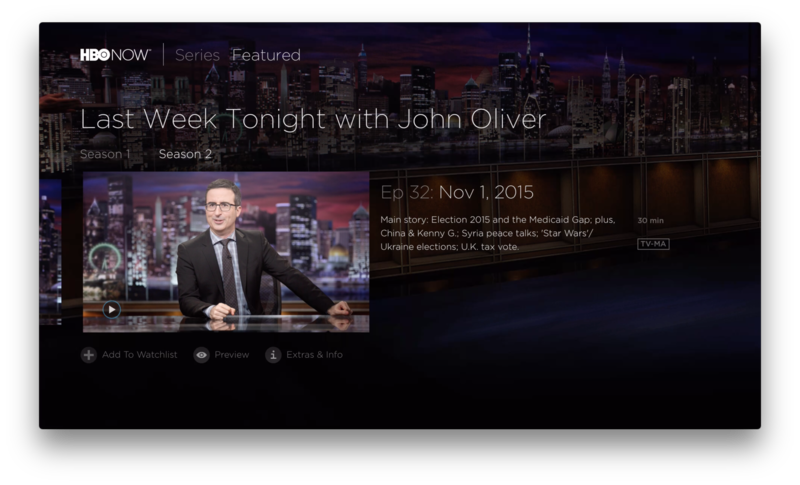 So when hunting the latest episode of Last Week Tonight from the TV shows section, for example, you first pick the season then swipe through however many episodes come before it. This happens in other apps like Hulu as well and Siri search helps but doesn’t completely solve it. 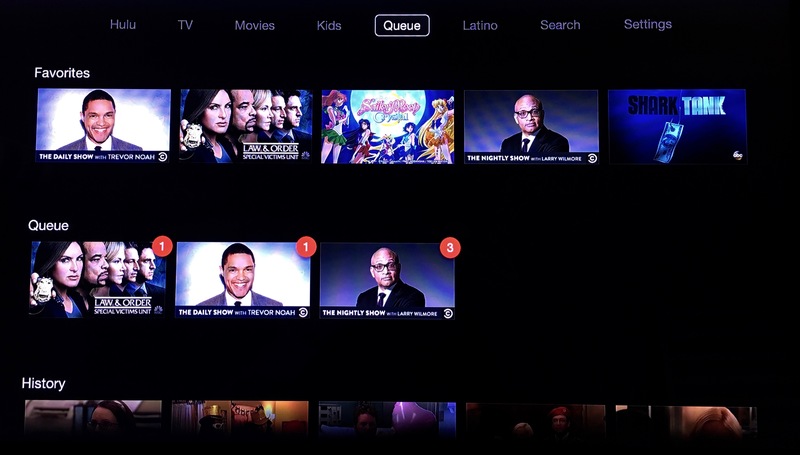 I’m not suggesting that new Apple TV apps should port their old limited layouts from the third-generation box to the fourth-generation box. That’s all YouTube has done so far and the result is a rather unremarkable user experience visually. The stock apps, iTunes Movies and TV Shows, show what is possible and its disappointing to see third-party apps nowhere close to comparable. I do think there’s a massive opportunity for these popular apps from Netflix and Hulu to meet the usability of their old layouts and build around that experience. Apple TV is getting dinged for a lot of missing features from Apple that will likely be addressed in time, but the freedom to move from uniform apps to widely ranging designs on the new Apple TV is a usability concern that won’t necessarily be addressed without highlighting the issues. Plex, an entirely new app to Apple TV but one that I don’t personally use for now, strikes a pretty good balance of taking advantage of the new capabilities while still maintaining good navigation and sense of place. And the new Apple TV as a whole is a really welcome product in my home. As I discussed on this week’s Happy Hour podcast, I’m enjoying many of the new apps and games that aren’t just video channels. For that reason, I’m hopeful that we’ll see improvements to the current popular video apps like Netflix and Hulu on the platform. Agree or disagree with these points, let us know in the comments!